The gallery has been re-hung with paintings and works on paper after our return from our painting trip. 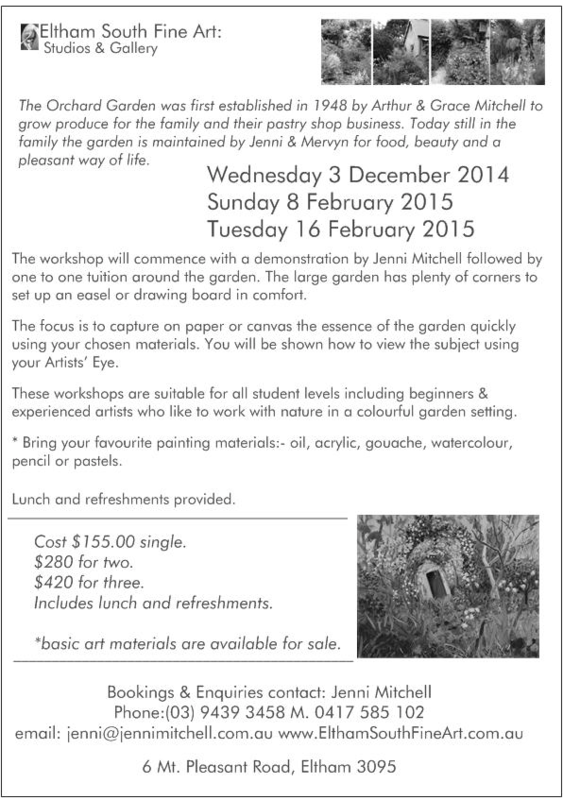 Winter is a lovely time to come and attend a painting class or workshop in our warm gallery environment. There are currently vacancies in the Thursday and Friday morning sessions. If your are interested in Saturday afternoon please contact the gallery and we will will resume that session too. We will run a series of exciting workshops in the coming weeks – details soon to be finalised. Usual gallery days for gallery viewing, classes and Picture framing (Studio Framing) are Thursday, Friday, Saturday and Sunday. We are generally contactable and available for viewing and picture framing outside of these days too by arrangement. Please phone Jenni (0417 585 102) or Mervyn (0411 423 886) to make a time. Look forward to seeing you soon in the gallery. Eltham South Fine Art: Studios & Gallery will be open for 2016 from Thursday 4th February. Our first exhibition for the year is a collection of recent works on paper by Jenni Mitchell and Mervyn Hannan. These works have been made in the field on travels to the Outback Queensland gem fields of Sapphire, Emerald and Lightning Ridge, Tibooburra and White Cliffs North West New South Wales, Digby and Portland in Victoria’s Western District. Included are watercolour, pastel, gouache and photography. Do come and join us for a celebration treat on Sunday, 21 February from 2.00pm or come anytime soon for a preview. Also on exhibition are a number of Exotic Textiles, Silks, Silver and precious stone Jewellery, Bronze Sculpture, Photography, ceramics and many other wonderful things. Painting Classes with Jenni Mitchell and held at the Gallery Studios weekly on Thursday, Friday and Saturday mornings and Thursday afternoons. As needed we also hold a special Saturday afternoon class and have spaces available for private tuition one on one. Contact Gallery for further details. We have been operating STUDIO FRAMING Custom Picture Framing for our location since 1988. Clients and artists needing picture framing may now come directly through the gallery at 6 Mt. Pleasant Road Eltham when the gallery is open or phone for an appointment and call directly into the framing studio at 19 Fordhams Road Eltham (same property access from back on Fordhams Road). Mervyn can be reached on 0411 423 886 or phone Jenni 0417 585 102 or gallery on (03) 9439 3458. 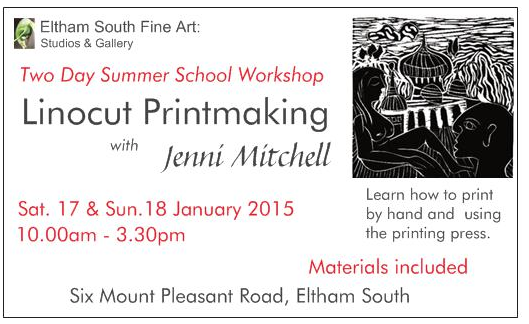 Eltham South Fine Art Gallery will be closed between Christmas and New Year and open periodically throughout January. Look for the Red umbrella or phone for times. M. 0417 585 102. We wish all of our friends, students, colleagues and new visitors to our gallery a Happy and SAFE summer period and look forward to seeing you in and gallery in the New Year. Stairway to Heaven: Exotic Textiles & Other Beautiful Things is an eclectic collection of beautiful hand woven and embroidered textiles from around the world along with local ceramic works by Geoff Davidson, paintings and works on paper by various Mongolian artists, Jenni Mitchell, Grace Mitchell and Mervyn Hannan. There are colourful Turkish Ceramic pieces, garden porcelain and African carved wood pieces. We are also introducing to the gallery White Cliffs jeweller Linda George. We met Linda recently while on our painting trip to Tibooburra and White Cliffs. She is an extraordinary artist working with gold and silver using both local and other Australian Opal in her settings along with pearls and fine gemstones. Linda works from her underground opal mine home. We have a selection of jewellery in our showcase by Linda. The exhibition will continue through until end of December and is open Thursday to Sunday. Hours Thur – Sat 10.00 – 5.30 and Sunday 11.00 – 5.00. (Note: Please check first re: Sunday as on occasion the gallery will be closed on a Sunday). Hal Barton, a former Eltham artist identity recently passed away. Hal had been living in Noosa on the Queensland Sunshine Coats for many years where he has continued to paint and exhibit his work. Hal was fine Australian Landscape painter and Portrait painter; becoming a finalist in the Doug Moran Portrait Prize in 1992. He was very much part of the artistic community during the heady days of Eltham in the 60s and 70s. Gallery closed Sunday 19 April until Thursday 30 April 2015. 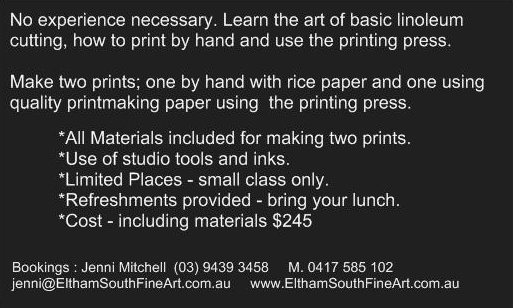 Eltham South Fine Art: Studios & Gallery will be closed Sunday19 April and re-open Thursday 30 April. 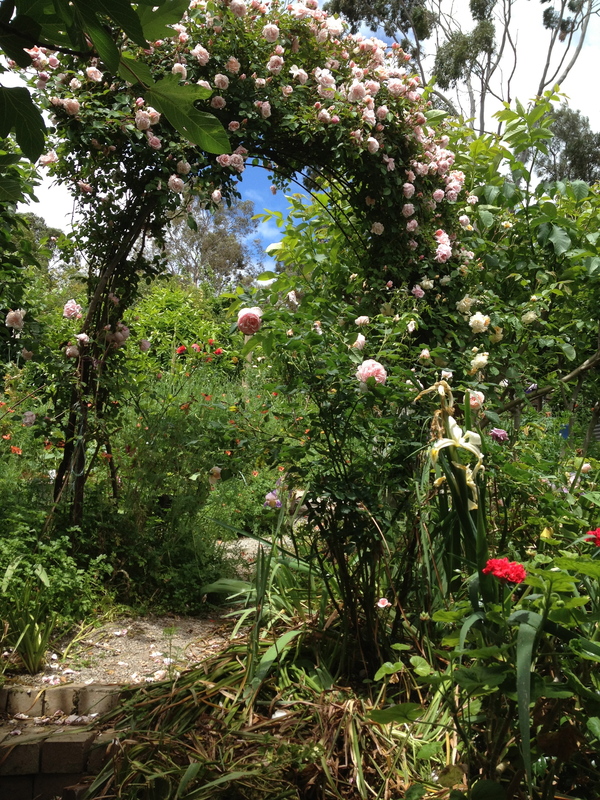 Come and join Jenni Mitchell and Mervyn Hannan on an all day field sketching workshoop in Melbourne’s beautiful Botanical Gardens. Meet: The Melbourne Botanical Gardens Terrace café. Lunch: BYO or have lunch at the Café. This workshop is designed to help prepare the artist for a ‘day out’ sketching. You will take just enough materials for easy management and carrying in the field. No need to bring easels. Bring what you can easily carry – think visiting a foreign country, a train trip, a visit to the beach, city or landscape and plan to come home with some field sketches to work up in the studio, or not. Suggested materials include – pencils, pen and ink, watercolour and pastels. You will need a sketchbook or drawing board with paper cut to size and fixative if using pastel. Watercolour, gouache and ink artists will need a bag that will carry a palette, brushes, water container, rag or paper towel and water. This may include a bottle of drinking water that can be refilled from a tap in the park. You may like to simply come with a pad and pencil. Suggested black led pencils include a variety of sizes from H to 6B, ie: hard and soft black lead pencils. Coloured pencils are also useful including watercolour pencils. You may like to use charcoal. Wet ones are useful for cleaning hands in the field. You may like to bring a cushion, light blanket or something to sit on if planning to work on the ground. There will be seats throughout the gardens – but you may need to be quick to secure a spot. It is a public holiday and if the sun is shining the gardens will have more visitors. This can add to the subject material – and the need to sketch quickly. Bring enough paper and materials to last the day. There will be panoramic subjects to paint and exquisite close up work to do. The choice will be up to you. I will give a demonstration of a variety of subjects in different mediums and then help each student as a one on one with your chosen subject. November is looking good at the Eltham South Fine Art: Studios & Gallery. The Orchard Garden is in full bloom and producing an array of Spring Flowers and vegetables. Several Garden Workshop dates have been organised for painting in the Orchard through to February 2015 and during the Summer break in January a two day linocut printmaking workshop will be held in the gallery. Bookings are now being taken for these workshops. The Orchard Garden in Spring Bloom. Jenni Mitchell and Mervyn Hannan’s private studios will be open for the next two weekends as part of the Nillumbik Shire Open Studio program. 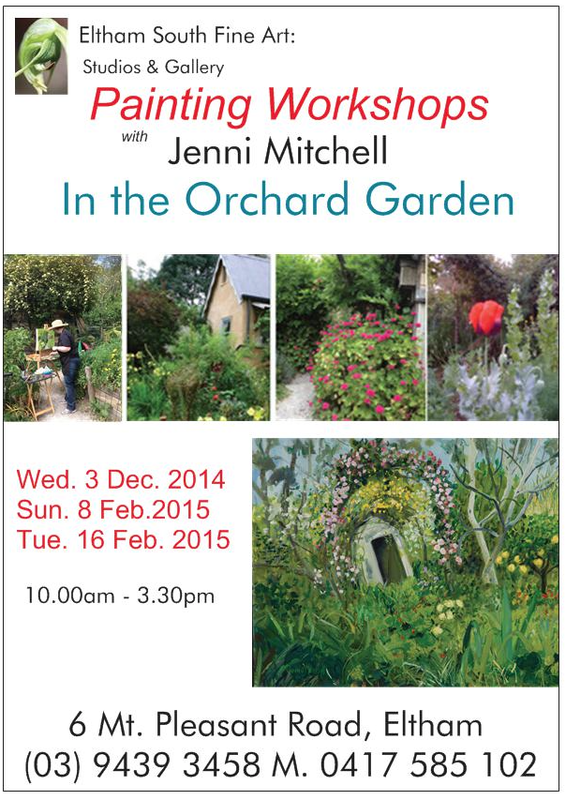 Come into the gallery studio and through the orchard to the visit their private working studios. The current exhibition in the gallery is a selection of works by Jenni Mitchell and Mervyn Hannan. New into the gallery are some beautiful silver and gemstone jewellery made by artists and craftsmen from ethnic Hill-tribe communities and work by several Nepalese women’s communities. We also have new work from Mongolia, Timor, Nepal and India. 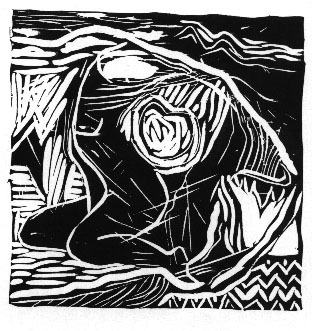 ‘Woman with Stone’ Jenni Mitchell Linocut Print.